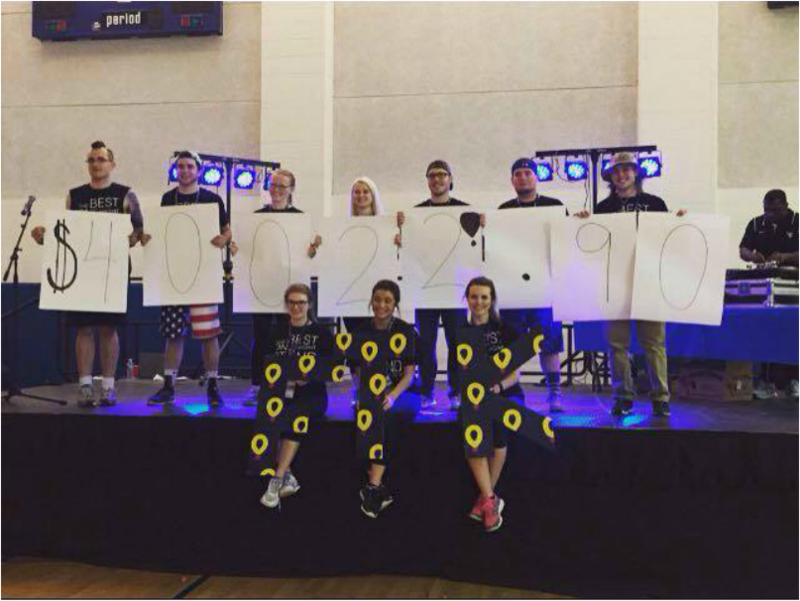 Dance Marathon at West Virginia University, known as MountaineerTHON, holds an annual 8-hour event where hundreds of students stay awake and on their feet to raise money and awareness for our local beneficiaries. Our mission is For the Kids with a commitment to raising funds for children in need of specialized pediatric and medical care that otherwise are not available to them due to the inability to cover medical expenses. MountaineerTHON, is the largest growing student-run philanthropy on the West Virginia University campus and benefits our local Children’s Miracle Network hospital, WVU Medicine Children’s Hospital. We are a part of over 350 college campuses across the country fighting, For the Kids! The 8-hour event is a high energy, entertainment packed event, where dancers commit to being on their feet for 8 hours, standing for those who can’t. Dancers, volunteers, and local community members are inspired by local performing artists and student groups, sponsored theme hour activities, and by meeting local miracle families who have been directly affected by the funds raised through events like MountaineerTHON and have been treated at our local Children’s Miracle Network Hospital. In addition to the 8-hour marathon, MountaineerTHON hosts additional events throughout the year. Our mission is a year-long effort and a year-long celebration! Children’s Miracle Network is an international non-profit organization that is dedicated to raising awareness and funds for children's hospitals. WVU Medicine Children’s Hospital is the local Children’s Miracle Network Hospital participating hospital for the state of West Virginia and parts of surrounding states. WVU Medicine Children's Hospital is the state’s premier pediatric health center. Our donations help to provide innovative and comprehensive care, support pediatric research, and the purchase of the latest technology to maintain this high standard of clinical care. WVU Medicine Children’s Hospital has a high commitment to providing a comfortable environment for families during hospital stays, and our donations help provide many of the services and programs to make this possible.